Hardcover watercolor journal with 100% Cotton Saunders Waterford watercolor paper. 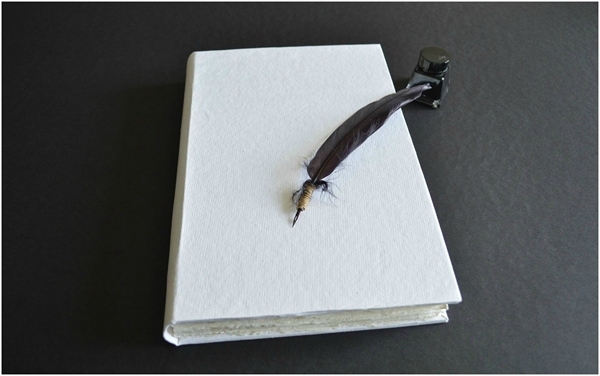 This blank book is the ultimate journal / sketchbook for the watercolorist. It can serve as a watercolor journal , a traveler's sketchbook, a mixed media or acrylic journal or simple as an organic book for a special presentation. The book is hardcovered and the covers are dressed with handmade Khadi watercolor paper, so you can customize it to your heart's delight. This is a 100% cotton paper made by hand in the village of Tarihal near Hubli, in Karnataka, South India. Khadi rag papers are made from 100% cotton rag, which have longer fibers than linters that are generally used in papermaking. These genuine rag papers are known for their exceptional strength and durability. It has 46 pages of top quality professional 100% Cotton Saunders Waterford watercolor paper of 356 gsm (260lbs) from St Cuthberts Mill in England. It is ideal for watercolour, gouache, acrylic, pastel, pen & ink, pencil, charcoal and printmaking. CP (not) surface. Although I try to use the embossed seal part of the paper as the inner covers, it is sure that you will encounter it in one (or even more if you are lucky) of your pages! All pages are torn by hand - no metal knife was used! It comes with its own black non-woven bag, to be stored safely and/or be nicely presented as a gift. All my journals come with a certification of authenticity. Saunders Waterford® is an exquisite watercolour paper, traditionally made on a cylinder mould machine. This is the superior quality watercolour paper made by St Cuthberts Mill and comes with the Royal Watercolour Society’s endorsement. Made using 100% cotton, the highest quality papermaking material, to high archival standards. Each sheet is buffered with calcium carbonate to help defend finished pieces of work from discolouration caused by acids present in atmospheric pollution. Its attractive surface is created using natural woollen felts that give it a distinctive random texture. The surface is sized in gelatine making it strong and resilient to scrubbing, and other rough treatments.